Hello from the little village of Kinlochleven in Scotland, between Glencoe and Fort William. I was a member of the forum several years ago under a different ID but lapsed, though still been checking in regularily over the years. 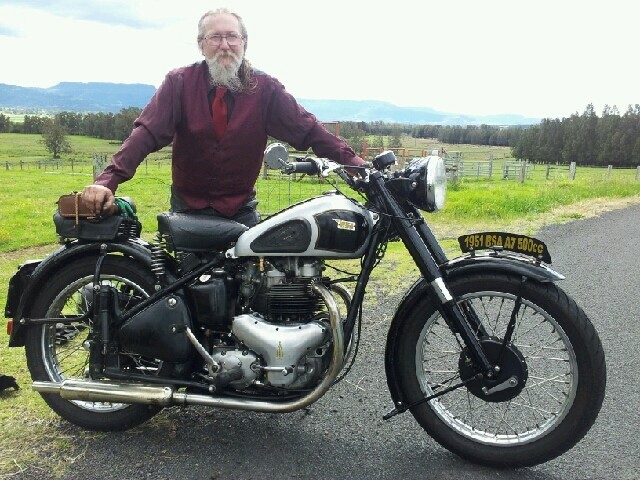 I started riding bikes many years ago with a BSA C11G which was thrashed mercilessly round the farm and was soon replaced with an ex-WD Matchless G3L for the same purpose. I then got an old S/A B33 which I converted into a scrambler and used it for scrambling, grasstrack and sand racing then subsequently converted it into a Tribsa. I was by then riding a BSA Road Rocket on the road and converted that into a sidecar outfit for the same purposes, using Douglas Dragonfly forks. An Elstar J.A.P.500, a Hagon BSA C15, and a 250 Greeves were subsequently added to the stable and I rode these until marriage and a family got in the way. I still have the Elstar, the Greeves, a 1974 Triumph Daytona, a 350 Triumph/Greeves and the Road Rocket engine and gearbox. (The cycle parts of the outfit were written off in a spectacular crash which caused my 8 month pregnant wife to insist volubly that I stopped racing). I am now retired and on my own and have thought for some time about finding cycle parts to rebuild the Rocket but I also have had under my bench the cycle parts from my Triton which ended it's life with a terminal engine blowup so I have been messing around on and off with the idea of building a Norbsa. And here endeth the story for the time being !!. A few pics attached relevant to the story. The norbsa looks like a good project that's waiting for attention. Welcome back, thanks for intro story. Used to pop across to Kinlochleven visiting relatives. Have even ridden the pre '65 Scottish there. Wasn't actually last... Now lurking in the Scottish Borders. Not so very far away. A7, A10 & B31 in the stable. Look forward to hearing of the rebuild. Great roads in Scotland, perfect for a BSA twin! Very nice introduction, welcome back to the flock. Thank you all for the welcome messages. Black Sheep, if you were into trials we may have met. I was Lochaber club secretary for most of the 1980's and again in early 2000's. Also resurrected the Kinlochleven club in 1988, mainly for the local youngsters but we also did a few bigger trials. I still have my old Comerfords Bultaco Sherpa 340.